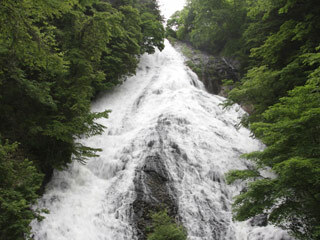 Yu Waterfall (湯滝, yudaki) is one of the waterfalls in Nikko. It has 50m (166 ft.) high and 25m (83 ft.) width. Water come from Lake Yuno (湯の湖, yunomizuumi) which is one of the 100 best mountain in Japan. There are many hot spring around this fall. It is very beautiful long slow fall, and there is short hiking course side of the fall. Because water splash widely, it looks like white curtain of water. There is parking: fee 410 yen. Restaurant and gift shop are located right next to the bottom. You can eat fresh fish here. The water come from Lake Yuno, and run into the Lake Chuzenji. Yu means hot water, but the water of the fall is not hot spring. Because there are many hot spring around the lake and fall, this fall was named hot water fall. There are many hiking tours from Nikko station and Tokyo Station. It might be easy to visit here by joining the tour. There are many beautiful mountains and Senjogahara (戦場ヶ原), means battlefield, around this fall. You can also enjoy flowers and autumn fall in this fall. Also there are many ski sites around this fall. In the winter, this will be frozen up. It might be nice to visit combining skiing.